Doughnut are loved by all age groups once you achieve making fluffy warm doughnuts at home you would never want to buy the ones from outside. 1/2 cup powdered or regular sugar for coating. Add flour gradually and process until you get a soft dough. Bring it out in a bowl, cover and stand in a warm place for 30 min. Divide the dough into 2 , dust a board with some flour and roll out each portion to 1" thick large square. Take a small round cookie cutter and cut the dough into small circles and set aside for 10 min covered. Heat oil over medium heat and deep fry the doughnuts until golden on both sides (45 sec each side)remove from heat and drain out the oil. Coat with sugar and then fill the doughnuts from the sides with a filled icing bag of your choice of filling. Do this until done with all your doughnuts, set on a serving plate and serve. Hi Ritika and thanks for always being appreciative,As 4 ur Query; What u need 2 do is fill an icing/pastry bag with your choice of filling(custard,jam or ..) using a plain tip poke a small hole in the side of the doughnuts and fill the centers with approx 1tbsp filling or u can use a disposable syringe fill that wit ur filling then poke a hole with it's tip and fill the doughnuts. these doughnut have always turned out excellent and fluffy with me and I hope it does with u 2. Hope that helped. 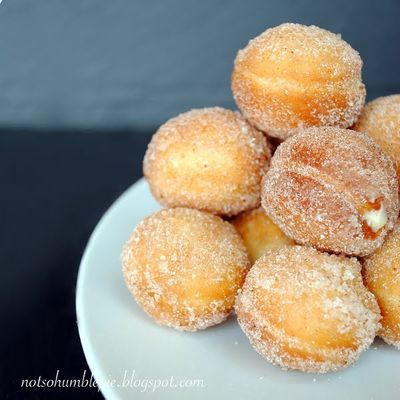 Enjoy home made warm doughnuts. wooooooooow .Most-wanted recipe for all !!!! thanx 4 sharing.but a querry I'm not able 2 get thru the filling part.Pls clarify.